You cannot listen to the pronunciation of ran gu because your browser does not support the audio element. Note: This Chinese character can also be pronounced lóng quán. However, with a different pronunciation, the meaning of the character will change as well (not yet available in this dictionary). For obtaining stroke order animations, visit the links to the individual characters below. *Clicking on one of these characters will take you to the "normal" Han Trainer Dictionary for Chinese Language. 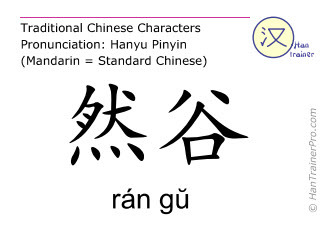 The modern (simplified) Chinese characters of rán gŭ are identical with the traditional characters displayed above. In Traditional Chinese Medicine (TCM), traditional Chinese characters are normally used to designate the points. Contact us! We always appreciate good suggestions and helpful criticism. This dictionary about Traditional Chinese Medicine (TCM) is still under development and will be improved step by step.